Q. Did you play especially the first set about as well as you could play on hard courts here? Have you ever played better? RAFAEL NADAL: I don't know. I think I played great the first set. It's my first set so far this year [at] 100 percent. I'm very happy the way I played the first set, I think. I did all the things that you expect to do good in the first set, in my opinion. I am very happy with the way that I moved myself on court, very happy that the way I hit my forehand and my backhand especially. So in general it was my best match of the tournament, so that's great news to be in quarterfinals and played my best match of the tournament. But every day, no, just happy. To be in the semifinals is very important result for me. Is fantastic win, so just enjoy it today. Q. You have known Richard Gasquet since you were kids. Can you talk about your relationship with him through the years? RAFAEL NADAL: He's a nice guy, very nice person, one of the players on the tour that I feel closer because we are from the same age. We always had a good feeling. So it's great, no? When you see a player like Richard that we grow up in, you know, similar ways and we played when we were kids. Today we have the chance to be in the semifinals of the US Open, so is great. Is a great thing for both of us, so very happy. Q. How good do you feel on hard courts right now? RAFAEL NADAL: Every day the same (smiling). I don't know. Not every day is the same. You know, I don't have the same feeling every day. I feel that today I played much closer the way that I want to play, playing more aggressive, with my backhand without losing court. When I had the forehand I was able to change the directions a lot of times and with a lot of precision. I'm sure that's the way I have to play to keep having chances to be successful in every surface, but especially on this one. I was able to do it today; I hope to be able to do it in two days. Q. Do you feel strong, like you saying in the beginning, very aggressive, do you think you're going to be ready to beat Djokovic if you have to in the finals meet with him? RAFAEL NADAL: Do you think Djokovic will be in the final (laughter)? I don't know if I will be, so I hope to be ready to play a good match against Richard. If not, I will not have the chance to play the final. So if I don't play great match against Richard, I will see the final on TV (laughter). I am focus only to play great match in semifinals against Richard. He had an amazing victory today against an opponent that he didn't have a great score, you know, head to head against David. He was able to change that dynamic, so that's a lot of confidence for him. Now he has two days off of rest, so he will be full confidence and full recovery for that semifinals. I hope to be at my 100 percent. That's the only way I feel I'm going to have my chance in that match. Q. What kind of match do you expect on Saturday against Richard? 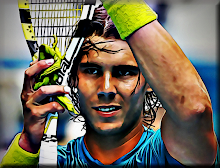 RAFAEL NADAL: I expect to him very good Richard. He's playing a great tournament. Two great wins against Raonic and now against David. Great confidence for him. Five set victories against tough opponents, that's brilliant for him. He will come to that match with good confidence. He will play with confidence. I am sure on that. I need to keep playing my way, aggressive style like I did today. If feels like this and I keep having the feeling of today, I hope to have my chances.